A (very!) 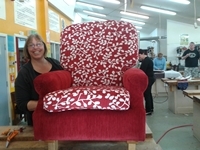 intensive weekend workshop where you'll learn the basics of upholstery and rejuvenate a small piece of furniture. A separate Friday evening measuring-up session (bring your project) is included so please check dates carefully. [Note: No evening session for May course - see below]. An introduction to upholstery and the opportunity to bring a favourite piece of furniture back to life. Please note this course is not suitable for vehicle upholstery. The course consists of an initial session on a Friday evening when you bring your project and Steve advises you on fabric quantities, any necessary repairs and other requirements (note: not the May course). [*Short information session (5pm to 7.00pm) for fabric quantities and other requirements – bring your project]. On the weekend, bring a sewing machine (if Steve tells you your project will require sewing), heavy duty needle (optional), upholstery thread, hammer, old chisel, fabric scissors, old blanket or drop sheet, pen and paper and lunch, along with your project and the fabric and other materials Steve says you will need. Some basic materials are provided as part of the course fee but please bring cash to pay Steve for extras you may need. Small projects only, please (chairs, stools, pouffes etc) – wing chairs, sofas and settees will not be suitable for this workshop.